I still cannot believe I found these shorts at the thrift store and the fact that no one cared to pick them up. I mean, they are stripes with an awesome color palate! But then again, I have been told by many that they find it difficult to thrift. You guys! It's not that hard. All you have to do is imagine it looking badass pairing it with something else. You can always alter the clothes since they're uber inexpensive! Gold and turquoise slave bracelet: My own jewelry! These shorts are AMAZING! You are soo lucky you managed to pick these up! 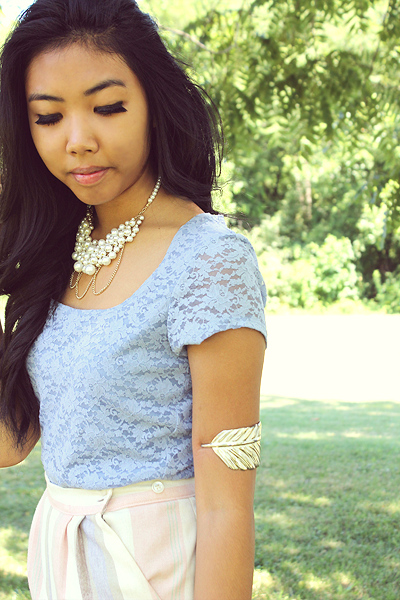 I love this whole outfit, its very prettyy! So cute!! I love your shoes!